Kerry Hardwell toasted a title win in his first season as a manager but insisted: The players deserve all the plaudits. Rustington were crowned SCFL Division 2 champions for the second year in succession after a goalless draw at Copthorne. The Blues wrapped up the title with five games of the league campaign remaining - and they’ve still to taste defeat in that competition this term. But Hardwell, who took his first role as a manager with the club last summer, is still hungry for more success this season. Rustington can still complete the double for the second straight season, with a League Cup final on the horizon. And Hardwell always wants his side to go through the SCFL Division 2 campaign unbeaten. He said: “The hard work the lads have put in this season, they deserve all the plaudits. “The boys created a bit more history for the club becoming the first group to win back-to-back titles. “I’m still hungry to finish the league campaign unbeaten and we’ve got a cup final to try to win. Rustington failed to win the title in style, but a goalless draw at Copthorne was all they needed. There were few chances in what proved to be an even contest between the teams that will meet in the League Cup final. 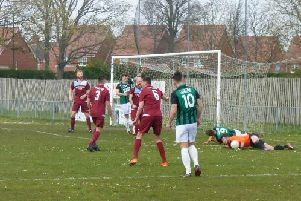 Goalkeeper Billy Nash tipped over Oscar Weddell’s first-half attempt to keep the scores level. The Blues applied the pressure after the restart. But forward Josh Irish hit a post before Alex MacIver saw an effort cleared off the line. But those misses did not matter as Rustington collected the point they needed for the league title. Hardwell also thanked his coaching team for the support they’ve provided throughout the season. He added: “I was over the moon to finally get the league wrapped up. “I don’t think there is anyone in our league who will say we don’t deserve to win it again. “The group collectively have been absolutely spot on for myself, Jon Tucker (assisstant manager), Mark Rowland and Ash Finch. Champions Rustington travel to Montpeliar Villa on Saturday.